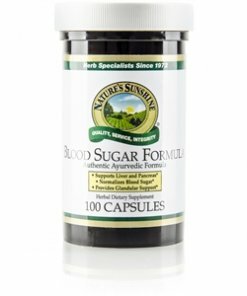 Nature’s Sunshine Ayurvedic Blood Sugar Formula blends herbs from India and is taken from Indian Ayurvedic herbology. It supports the blood’s ability to supply glucose to the body and maintain normal energy levels. The nutrients in the herbs included in Ayurvedic Blood Sugar Formula support the liver and pancreas, two organs that are essential to the body’s glucose levels.